I officially signed up on Bloglovin' so don't forget to follow my blog! You can follow me by clicking the link here... Follow my blog with Bloglovin. Don't forget to import all your favorites over as well! Signing up was sooo super easy and fast! If you have trouble claiming your blog, Megan from iTeach: What's Your Superpower posted a video going over each step. If you're like me and you just wanted some reassurance, her tutorial is perfect! It made it so super duper easy, it was unbelievable! 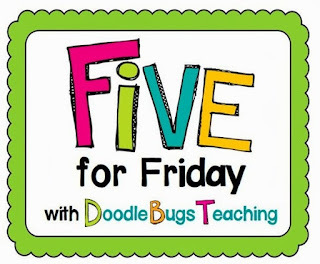 Since it is Friday and I haven't been working on a blog post, I figured I would link up with Doodle Bugs for her Five for Friday Party! On Monday, my summer school students and I worked on our How to Eat Fried Worms flip books. We also discussed how we'd choose to eat our own worms. Students decorated their worm plates and did a short writing activity. Thanks to KNJ Kreations over at TPT for a great unit plan. You can check it out here. I forgot to take photos of our finished products! Whoops! Then on Tuesday, major bummer... Iggy, my super adorable (most of the time) Italian Greyhound chewed up my new pair of shoes from Target! They were "Sperry" wannabes at such an affordable price. Now, penny pinching me has to decide if I'm going to buy a new pair or just go without my "Sperry's." Needless to say, I was not so happy with my little fur baby! Good thing he's cute! On Wednesday, I got a phone call that my newest project came in to my local JCPenney from my online order (free ship to store!). I am now the proud owner of a blue 18'' gumball machine for my classroom. Don't worry, I'm not sugaring them up -- if you've seen Pinterest, I'm going to turn my gumball machine into an eraser machine. I love the idea and hopefully it cut down on interruptions and "meltdowns" due to lack of erasers. I cleaned my house in the afternoon on Thursday. It's pretty spotless now and next week my mission is... THE GARAGE. But, Thursday night was really the highlight of the week. It was errand night... it doesn't seem like fun, but sometimes just getting out of the house is worth it! We stopped to get treats for the dogs and I was able to get some erasers for my gumball machine at Walmart. Plus, on one of the many stops, I was able to finally pick up Darius Rucker's new CD! I think I listened to "Wagon Wheeler" at least three times in the car that night... it's just so catchy! I also purchased Matchbox's Twenty new CD "North" along with Little Big Town and Blake Shelton's newest CDs. I'm on a huge country music kick right now... Country music just feels like summertime. For dinner, we went to Lime. This is a new Mexican Grill/Burrito type restaurant chain and I had a lovely frozen Sangria. If I can't go to to the beach... I'm going to bring the beach to Ohio! That brings me today... I'm exhausted. Between cleaning all week and teaching all week. I plan on catching up on the DVR and relaxing. It appears Iggy has the same idea as me! We're wiped out! I remember my teacher reading How to Eat Fried Worms when I was in elem school. How fun! Sorry about your shoes and love the gumball machine. Have a great weekend.